Just about to dash out for a family lunch, but I see that the lovely Alice has sent you over! So this is just a quick welcome to you *wave*. There's not much crochet here at the moment as I'm busy making MORE granny squares for my blanket (and wondering if it's rude to crochet at lunch...?). Anyway, thanks for popping in - and please do say hello and feel free to link so I can say hello back. Heheheee, yesterday I was wondering if it would be rude to crochet during a wedding service... I'm obsessed with crocheting circles for a blanket. I used to crochet during my lunch break at work but I no longer work. I was retrenched because they were overstaffed due to a downturn in the industry, not because of what I did during my lunch break. There days I crochet whenever I can find the time (ie when I not driving, browsing or sleeping). I'm glad I popped over to see your lovely blog. 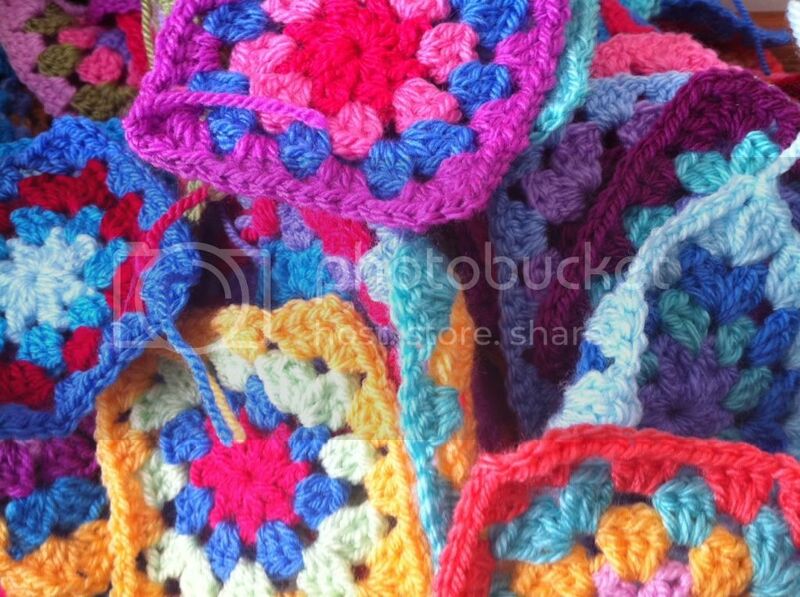 Your crochet squares are so colorful and should work up in to a beautiful blanket. Crochet or Knit at lunch? Absolutely...It is a great way to shift from work 'thinking' and give ourselves a much needed break. Wish I could figure out how to bring my crochet into a work meeting without the boss going bonkers. As I sit there listening to 'whatever' I think, boy I could be making some real progress if I had my project with me. Hi, yes, the lovely Alice sent me. Love the shawl pattern, I'm doing a bit of knitting but got 'hooked' on crochet and that is my love at the moment. Hi, I followed the link from "Crochet with Raymond" and I am so happy I did, this is a beautiful blog! And in this global age it is nice to find a lovely new-to-me crafty blog from someone in the SE England. I too love the shawl pattern, it'll definitely go to my queue. I followed the "Raymond" link too and I'm so glad I did. Just a flying visit now but I will be back to read more later. your crochet squares arebeautiful btw. Hi there, just popped over from Alice's blog - you have some lovely things on here. That shawl pattern is gorgeous.